One week before Passover, the UNESCO executive board, meeting in Paris, overwhelmingly passed a resolution that effectively denies the validity of two great world religions. This “passage” was diabolically ironic for the season of Passover — which Jews around the world began celebrating on April 22. The resolution, on “Item 19 — Occupied Palestine,” condemned Israel for violating the sanctity of a Muslim holy place repeatedly referred to as “Al-Aqsa Mosque/Al-Haram Al Sharif.” The place is the Temple Mount in Jerusalem, site of the two Jewish Holy Temples. The only reference in the five-page document to any Jewish connection to the spot is the words “Western Wall Plaza” — scare quotes in the original — coming after Al-Buraq Plaza, the Arabic designation honoring Mohammed’s horse, referenced without quotation marks in the UNESCO document. Only six countries — Estonia, Germany, Lithuania, Netherlands, the UK, and the U.S. — opposed this nefarious resolution, while 33 supported it. And while the solidly anti-Israel votes of the Muslim and Arab states and their sycophants are no surprise, the agreement of countries that should have known better — France, Spain, Slovenia, and Sweden — and the abstentions of too many others, boggle the mind. Surely these nations’ leaders are aware that Jerusalem is mentioned nowhere in the Koran, Islam’s holy book, and played no role in the formation of the religion. And they must also know how central the city is for Jews: as related in the Bible, King David established his capital in the city some 3,000 years ago, and his son Solomon built a Temple there, requesting of God, “May your eyes be open day and night toward this House, toward the place of which you have said, ‘My name shall abide there.’” (I Kings 8:29). That Temple was put to the flames in 586 B.C.E. by the Babylonian Empire and rebuilt a generation later, only to suffer destruction in 70 C.E. at the hands of Roman legions. Ever since, Jews never forgot King Solomon’s declaration, and ever after inwardly channeled their prayers through that “House” in the hope, indeed, the firm expectation, of an ultimate Jewish return to Jerusalem. Modern Zionism accomplished that return through the creation of the State of Israel. When Jordan attacked in 1967, after the Israeli government urged it, through UN intermediaries, not to join the Egyptian and Syrian aggressors, Israel took possession of the Old City of Jerusalem and its Temple Mount. It then did what no other country would have done under similar circumstances, allowing the Muslim religious authority to maintain control over the holy site where the Al-Aqsa mosque had replaced the two Jewish Temples, and ensuring that status quo to this day. That policy is consistent with Israel’s scrupulous protection of all religious sites in the country. The predominantly Christian countries that voted in favor of UNESCO recognition of Al-Aqsa Mosque/Al-Haram Al Sharif to the exclusion of any non-Muslim religion should surely know that each of the four Gospels relates an almost identical story of Jesus entering Jerusalem and visiting the Temple. He went there for Passover, which is where and when his death and resurrection occurred. UNESCO denial of the religious and historical Jewish connection to the city and the site of the Temples thoroughly undermines the basis of Christianity, not only Judaism. This Passover, let us resolve to end the ongoing international campaign to deny facts, demean and delegitimize Judaism and Christianity, and fabricate another, exclusively Islamic version of history. Jerusalem, the city of peace, is an excellent place to start. 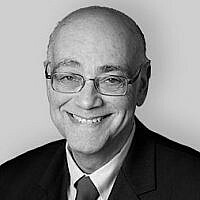 Lawrence Grossman is Director of Publications for the American Jewish Committee.